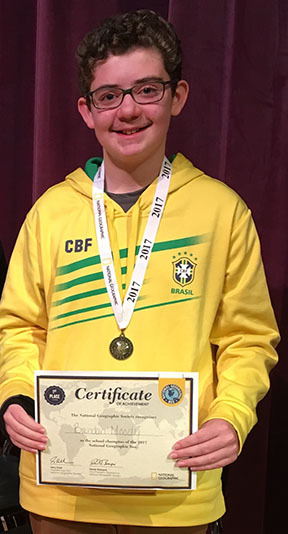 TRMS 8th grader and honor student Brendan Moody was crowned the National Geographic Bee Champion of the Timberlane Regional Middle School on January 10th. He will now advance to the state level competition at Keene State College on March 31st. The winner of the state competition will then compete for the national title at the National Geographic Society headquarters in Washington, DC in May. Brendan is the son of Jeff and Rebecca Moody of Atkinson.